settings4j provides you with a lightweight Java library that allows programmers not to worry about the location where the configuration settings are stored. Designed to ease the development process, settings4j can decide where the value will be placed, so the developer does not have to select the type of configuration. When I make a Project, I must decide where the configuration settings will be stored. You can get your Settings from Environment variables. The programmer says, that he want log some information. It is everytime possible to simply change the target (FileSystem, DB, MailServer, ...) where the information ist logged out. The Programmer must not care about it. For Settings, the Solution could be similar. The Programmer says he want the settings for Key 'xyz', and should not care about where the Settings comes from. The Deployer define where and how the value will be placed. By default the Deployer can chose to configure the developers app with the SystemProperties, JNDI-Context, Preferences (User or System) or the Classpath (in this order). 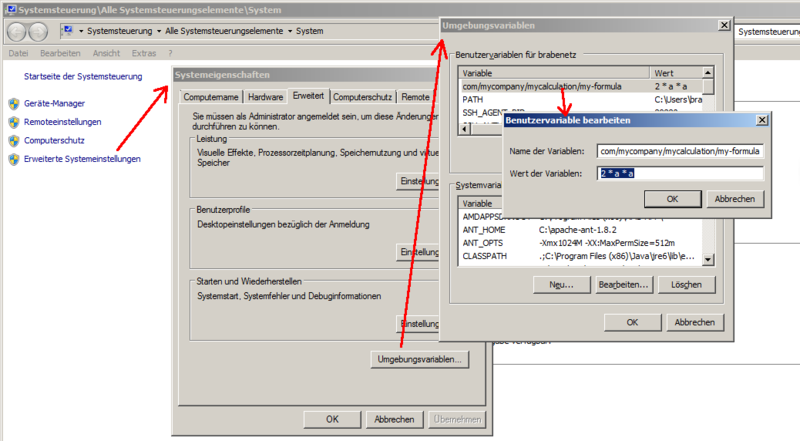 In this Example Settings4j.getString("com/mycompany/mycalculation/my-formula") returnes "a * a". In this Example Settings4j.getString("com/mycompany/mycalculation/my-formula") returnes "a + a * a". Since Settings4j-2.1 also Environment variables will be checked per default. At Second, if no value where found, a Upper-Case variant of the Key will be checked (e.g. : System.getenv('COM_MYCOMPANY_MYCALCULATION_MY_FORMULA')). Non-word character (everything beside a-z, A-Z, _ , 0-9) will be replaced by an underscore. Preferences stored and read by java.util.prefs.Preferences. In W98/Me/NT/W2K/XP/W2003/Vista/W7-32/W7-64 this information is stored in the fragile, hard-to-back-up registry in HKEY_LOCAL_MACHINE\JavaSoft\Prefs for system Preferences and HKEY_CURRENT_USER\JavaSoft\Prefs for user Preferences in a very fluffy format. Every capital letter is preceded with a / and any fields containing accented letters are encoded in Base64. In Windows, user Preferences show up at HKEY_CURRENT_USER\Software\JavaSoft\Prefs\com\mindprod\replicator and HKEY_USERS usernamexxx\Software\JavaSoft\Prefs\com\mindprod\replicator where the package name is com.mindprod.replicator. In Linux, preferences are stored in ordinary xml files. System Preferences are stored in etc/.java. 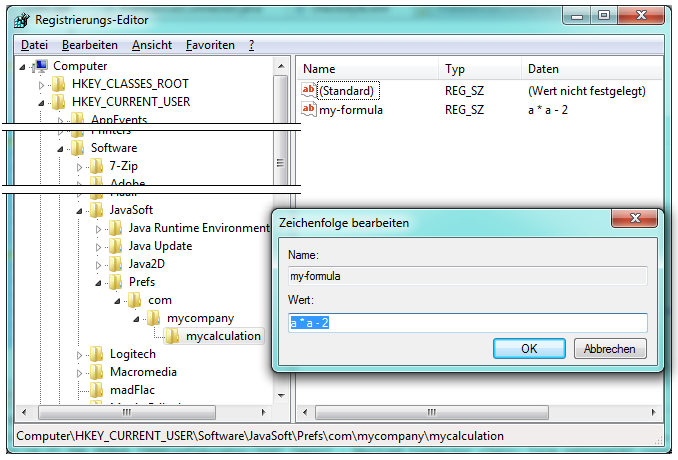 In this Example Settings4j.getString("com/mycompany/mycalculation/my-formula") returnes "a * a - 2". The ClasspathConnector reads the Content with "UTF-8" per default.